Sometimes we make up our own 2 1/2″ strip rolls, and below is a low volume white/grey/taupe roll we have done. It contains 40 different fabrics. It would be the perfect accompaniment to a bright modern roll where you need some lights. Isn’t it often the lights or darks we are short of? No pinking, so no debate which side of the zig-zag to sew on. Sold on our website or in-store. If you click on the picture, you’ll be directed to the website for a close-up. 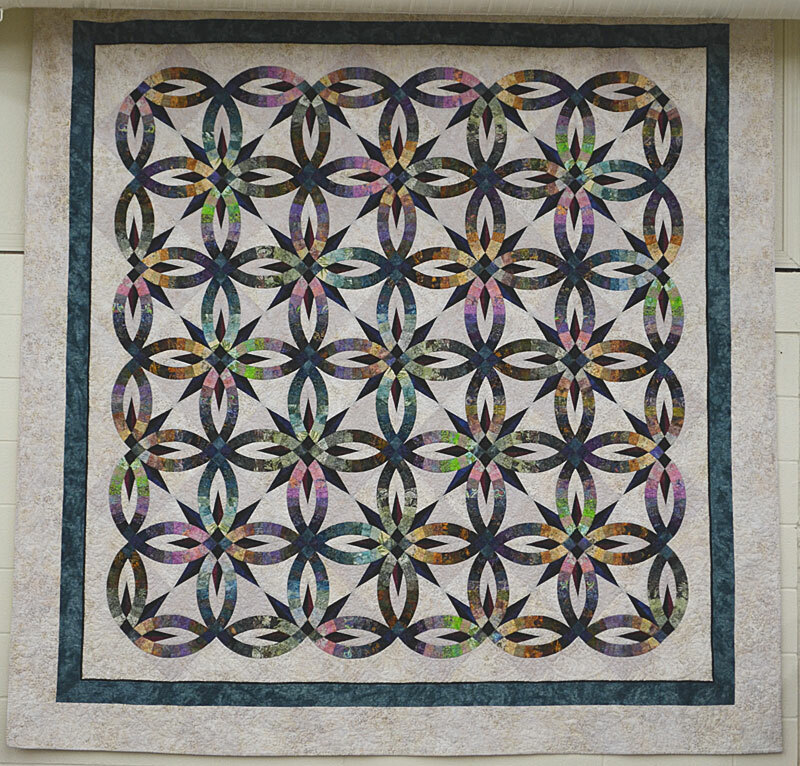 Another Stampede winning quilt we current have hanging in the store right now is Myrna M.’s Bali Wedding Star. This is a Judy Niemeyer pattern. This quilt glows where the colour pops. I don’t think the picture really does the colour justice. Perhaps because this is a big quilt, the camera couldn’t capture all the nuances. If you click on the picture, you can get a larger image. Myrna took a 2nd place ribbon. Congratulations Myrna!